BY THE LAST YEARS OF THE ROMANOV DYNASTY MIKHAIL NESTEROV AND ALEXEI SHCHUSEV WERE ALREADY FULLY-FLEDGED CULTURAL LUMINARIES IN RUSSIA. NESTEROV HAD WON ACCLAIM WITH HIS NATIONAL-ROMANTIC PAINTINGS SUCH AS "THE HERMIT", "THE VISION OF THE YOUNG BARTHOLOMEW", AND "THE MURDERED TSAREVICH DMITRY", WHILE SHCHUSEV'S DESIGN HAD BEEN CHOSEN FOR MOSCOW'S LARGEST CONSTRUCTION PROJECT - THE KAZAN RAILWAY STATION IN MOSCOW. BOTH MEN WERE REGARDED BY THEIR CONTEMPORARIES AS VERY ORIGINAL FIGURES IN CHURCH PAINTING AND ARCHITECTURE. THIS ARTICLE'S FOCUS ON THEIR ARTISTIC COLLABORATION IS NATURAL, BECAUSE NESTEROV, AL­WAYS DEMANDING OF HIMSELF, CONSIDERED THE CHURCH BUILDINGS DESIGNED BY SHCHUSEV IN COLLABORATION WITH HIM AS HIS GREATEST ACCOMPLISHMENTS MADE "ON THE CHURCH SCAF­FOLDING". MOREOVER, THE NATURE OF THIS COLLABORATION ARGUABLY INDICATES THAT THE TWO MASTERS INFLUENCED ONE ANOTHER. NOT SURPRISINGLY, AFTER THE BOLSHEVIK REVOLU­TION THEIR CHURCH-RELATED PROJECTS WERE RARELY MENTIONED. IN THE COURSE OF THE PREPARATION FOR THE EXHIBITION "MIKHAIL NESTEROV. IN SEARCH OF HIS RUSSIA", I HAVE MAN­AGED TO EXAMINE UNKNOWN EPISODES IN THE ARTIST'S CAREER, STUDYING THOSE OF HIS COM­MISSIONED WORKS THAT EVEN EXPERTS KNOW LITTLE ABOUT, AND IDENTIFYING IMAGES AND DRAWINGS NEVER PREVIOUSLY PRINTED. Shchusev was Nesterov's junior by 11 years. 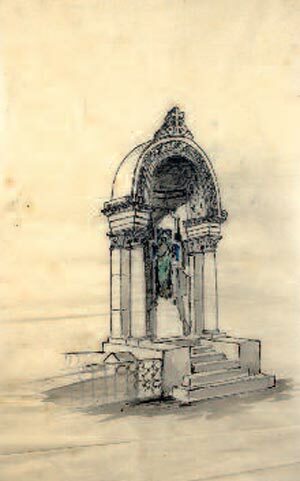 When, in 1903, Shchu-sev helped the artist out of a seemingly hopeless situation with the leaking roof of the cupola of the Alexander Nevsky Cathedral in Abastumani (in Georgia), Nesterov assumed the role of"older friend" and patron to the talented young architect. 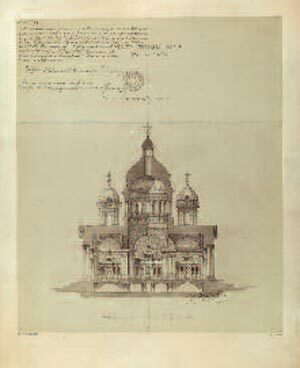 It was with Nesterov's help that Shchusev was later awarded several major commissions, three of which they worked on together: the Pokrov (Intercession) Church in the Marfo-Mariinsky Convent in Moscow, an iconostasis for the Troit-sky Cathedral in Sumy, and a cross on Pyotr Stolypin's tomb at Kiev's Pechersk Lavra (Monastery of the Caves). Only the edifice in Moscow has been studied relatively well because it has survived to this day almost unchanged, and the history of its construction is well documented. The other two sites have remained largely unexplored. 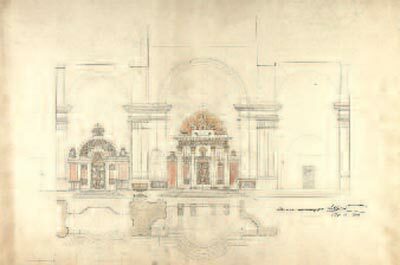 Several aspects of the masters' first collaborative project - the construction of the church at the Marfo-Mariinsky Convent (1907-1912, 1914)1 - deserve to be recalled first. Working on it, Nesterov was determined to set himself free from Viktor Vasnetsov's stylistic influences which, he believed, were present in his murals in Kiev and Abastumani2, and to find his distinctive voice in religious paintings, to fashion them in a style similar to that of his secular paintings. This did not agree well with the plans of Shchusev, who envisioned the Pokrovskaya Church done in the Novgorod-Pskov style of the 12th-16th centuries, and its murals elegantly stylised in the manner of ancient frescoes. Despite some disagreements over this point, Nesterov successfully implemented his ideas in the murals in the church, which is evidenced by the use of im-pasto techniques, as well as the enhanced importance of landscape, which appears to set off the psychological characteristics of the human figures in the compositions. Nevertheless, the icons from the iconostasis are indicative of certain concessions to Shchusev's wishes. The railing at the altar, and several murals forming one visual whole with it, can be considered the items that most harmoniously fit into the church's architecture. 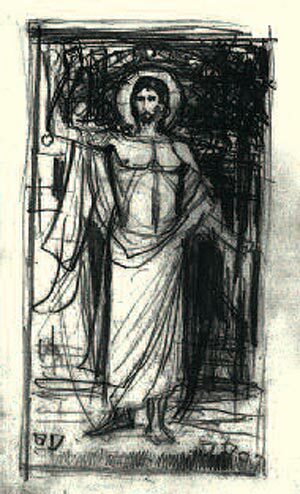 Nesterov embarked on a quest for his distinctive Christ, "the Russian Christ", in this sense following in Alexander Ivanov's footsteps. For the local icon of the Saviour he creatively re-worked the Saviour of the Fiery Eye's image from the Moscow Kremlin's Uspensky (Dormi-tion) Cathedral, which was also used as the basis for a mosaic piece on the western front of the Pokrov Church. 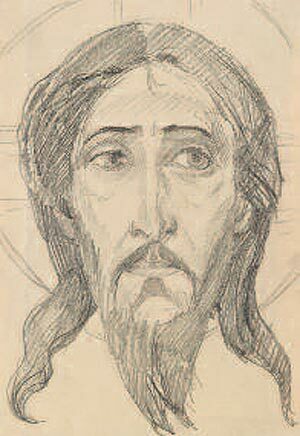 Nesterov himself wrote about it: "I was already told to avoid two extremes working on Christ's image - excessive sternness, on the one hand, and mawkishness (a previous failing), on the other. 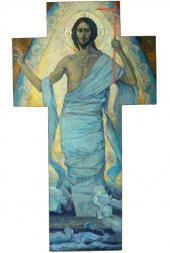 This stage in my explorations was reflected in the finished image of Christ created for the cathedral in Sumy. "3 The circumstances of the two masters' work in Sumy were radically different from those of their previous collaboration. The construction of the Troitsky Cathedral was begun in 1901, to the architect G. Sholtz's design and with the financial backing of Pavel Kharitonenko, a prominent Russian patron of arts and sugar producer. However, the client's financial difficulties caused the suspension of construction activities between 1905 and 1911. When Kharitonenko resumed the project, he asked Shchusev and Nesterov to complete the construction and decorate the church. The main difficulty for the two-man team was to come up with solutions that would match the already existing classicist edifice. Ultimately Shchusev drew inspiration for his Sumy iconostasis from the low altar railing, which was quite popular among Russian church architects in the 19th century, fine examples of which were produced by Carlo Rossi, Joseph Bove and Domenico Gilardi. According to Nesterov's "Memoir", preliminary agreement with the client was reached in February 1910: "It was then that the negotiations with the Kharitonenkos were resumed about the iconostasis for the Sumy Cathedral which they financed. I tentatively agreed to start working on the icons immediately after the completion of the Grand Prince's church"4 The first drafts of the church's design signed by Shchusev are dated 1911. Interestingly, the central iconostasis features only four icons in its local saints' row, which was assigned to Nesterov. In a letter of January 16 1912, the artist wrote to his closest friend Alexander Turygin that Kharitonenko commissioned only these four icons5. In other words, initially Nesterov had a fairly modest role in the creation of the church's decor, while Shchusev was responsible not only for the iconostasis but for the entire interior decor as well, including the design of the marble floor, railings, bells and church utensils. 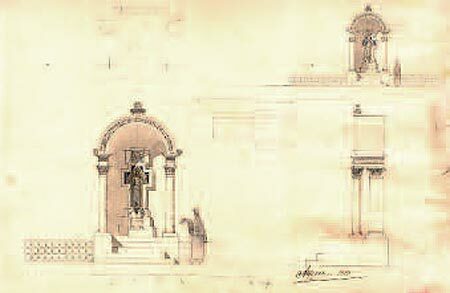 Shchusev had to opt for a "compact" altar railing on account of Sholtz's initial design featuring closely spaced dome-supporting pillars, which did not leave much room for the iconostasis. Besides, the dimensions of these supporting pillars, in the form of clusters of Corinthian order pilasters, partially hid from sight the main, northern and southern iconostases and did not afford the onlooker a full view of them. Surviving sketches allow us to trace the winding path the architect's mind followed before arriving at the optimal solution. First Shchusev enhanced the difference between the iconostases and highlighted the central one with a double colonnade. 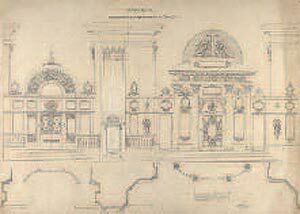 Then, abandoning a rectilinear plan, he came up with a fragmented plan for the altar railing and turned the colonnade into a semi-circular rotunda, thus leaving more room for the main iconostasis and enough space for six icons rather than four. Nesterov accomplished these six icons and the images on the Holy Gate, while Dmitry Kardovsky undertook the creation of some of the icons for the northern and southern iconostases. The final version featured the height of the entire altar railing increased due to the addition of a row of holy feast icons, some of which were accomplished by Kuzma Petrov-Vodkin, who also created a draft for the stained glass image of the Trinity above the altar. Shchusev enlisted the services of Ignaty Nivinsky for the creation of the murals inside the church. 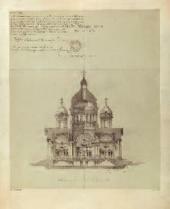 Early in 1913 Nesterov fulfilled his promise to his clients and "got down to drafting the icons for the Sumy cathedral. 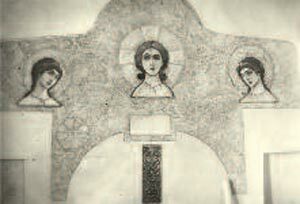 According to people who saw them, the drafts were more interesting than the icons in the monastery. The Kharitonentkos, husband and wife, often visited me at my house. Once I showed them my drafts. It can be safely said that they were ravished. "6 In late May-early June 1913 he finished "rough drafts" for the icons, but because of his sister's death postponed their completion until spring 1914. Unfortunately, the artefacts created for the project would be treated badly by history. The marble iconostasis made in Italy to Shchu-sev's drawings was destroyed as it was being transported from one place to another during World War I. Pavel Kharitonenko's death on June 13 1914, and the general difficult situation in the country closed the chapter on this project. The church was never sanctified before the revolution. The icons disappeared from it in the 1920s; two of them are now held at the Onatsky Regional Art Museum in Sumy, while the whereabouts of the rest is unknown. 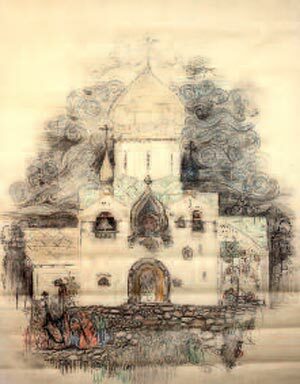 Nevertheless, the pre-revolution-ary black-and-white photographs from the Russian National Archive of Literature and Art (RGALI)7 and N esterov's watercolour sketches in the collection of the Tretyakov Gallery give quite a good idea about the compositions he created for the Sumy church. 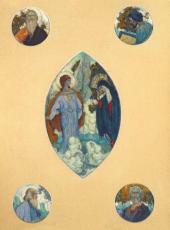 Nesterov was commissioned to make the images of the Mother of God, the Saviour, the Archangels Gabriel and Michael (on the northern and southern gates), St. Nicholas the Miracle-worker, the local Trinity icon, and small compositions for the Holy Gate (the "Annunciation" and the Four Evangelists). The elongated shape of the assigned spaces left the artist no choice but to paint life-size images. One can suppose that he took inspiration from more recent images than the ones he had drawn while working at the church in Moscow. The saints' costume and attributes have a secular element typical for icons created in the 17th-19th centuries (largely thanks to Western influences). This is obvious in the image of the Mother of God with the Infant, where the Queen of Heaven and the Saviour are clad in opulent robes, their heads topped with crowns, and the same is true of the Archangel Michael. Engaging with these formulas of icon-painting, Nesterov felt more at liberty to work on landscapes, which in that project were more suitable for the overall architectural environment than in the Pokrov Church of the Marfo-Mariinsky Convent. What is important is that in both churches the specific canonical images were viewed by the artist through his unique lens, re-interpreted and approached in the spirit of contemporary art. Significantly, Nesterov wrote about this project: "Here I'm on my own. Here I discovered something. "8 However, this distinctiveness was born out of close collaboration with the architect, since very specific goals and boundaries for the artist in terms of the number, dimensions and proportions of icons were set by Shchusev, who began working on Kharitonenko's commission at least one year before Nesterov became involved. As is well known, Nesterov never stepped inside the Troitsky Cathedral but worked on the icons in his workshop in Moscow, and the location for which the icons were intended influenced him only through Shchusev's technical drawings and pictures. Perhaps the artist and the architect were matching the colour of the marbles on the iconostasis, walls and floors with the colours of the icons, as well as the works of the other painters invited, with Nesterov's. That was one of the architect's goals - achieving harmony between all of the project's elements and avoiding cacophony. Their third collaborative project, practically un-researched, was Pyotr Stolypin's tombstone. On September 5 1911 the Russian prime-minister was assassinated in the Kiev Opera House, where he was attending a performance in the company of Nicholas II, the Tsar's family and associates. His will read: "I want to be buried where I will be killed"9. This wish ensured his interment in Kiev and also, to some degree, defined the group of those involved in the creation of his tombstone. On the authority of Nicholas II Stolypin's body was committed to earth in the Kiev Pechersk Lavra (Monastery of the Caves), by the northern wall of the Troitsky Refectory Church dedicated to the saints Anthony and Theodosia Pechersky, near the graves of Russian and Ukrainian heroes. A makeshift wooden cross and a container to collect alms for the permanent gravestone were placed on the grave. The design of the gravestone was commissioned to Shchusev, who had already worked at the Lavra in 1901-1910, designing the iconostasis and the interior decor of the Refectory Church and the iconostasis of the Assumption Church of the Mother of God. By the time he received the offer in April 1912, Nesterov was busy working on sketches for the Sumy church. But his daughter's illness and preparations for her wedding perhaps put a strain on his financial resources, which could have influenced his decision to undertake the design of the tombstone: "And this costs me a pretty penny. Ah well, I've committed to preparing an image for Stolypin's grave (for mosaic), these 3,500 rubles will come in handy. "10 Although this may not have been the main reason. His memoir and unpublished letters held in the Russian Museum's Department of Manuscripts tell us that Nesterov approved of Stolypin's policies and liked the man's personal and professional qualities: "gone is a man of strong will. Considering the total lack of persons of character among statesmen then, the murdered man was the last one of a breed. The shot at Stolypin was a neat shot at the Old Russian Statehood. "11 In the same letter Nesterov named the initiators and probably the financiers of the gravestone: "Again there is agitation a propos the Stolypin memorial, with both the Balashovs and the Shcherbatovs in the game"12. In 1912 Shchusev created a design for this gravestone, with Nesterov's mosaic composition on the theme of the Resurrection centrally featured. It was to occupy the entire front side of the massive cross on a stepped base over the deceased man's head. The mosaic composition was to be facing east, with the back of the cross facing west (towards the church's main entrance), the reverse of the cross adorned by the artist with a crucifix in relief. 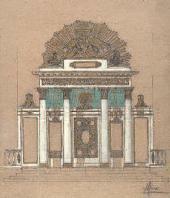 Nesterov sketched this mosaic piece in his own hand on a technical drawing created for this version. Little time was allotted for designing and executing the gravestone - a much simplified version of it, which survives today, was mounted in the same year. The black marble gravestone is austere in a nearly suprematist vein, featuring on its reverse, not a crucifix in relief, but only an octagonal cross consisting of four small lines notched in the stone. The architectural forms in the design of this gravestone were in essence only a frame for the mosaic, a strong structure to support it. But the execution of the mosaic piece was delayed, and without it the structure looked cheerless and depressing. This could have been one of the reasons why it was proposed to Shchusev to radically re-work his design13. In 1913 he accomplished a new version of the gravestone's design, which, regrettably, remained unrealised. It too was dominated by a massive cross with a mosaic composition. In this version the cross was put on a pedestal consisting of several steps, under a canopy-like structure (ciborium) made of white marble, and assigned a place near a wall of the Refectory Church, that is between Stolypin's grave and the adjacent graves of Ivan Iskra and Vasyl Kochubey, linking the three men compositionally and symbolically (all three were patriots who gave their lives for the motherland and the Tsar). The choice of a pseudo-Byzantine style for the structure was apparently dictated by the desire to fit it into the ensemble of the monastery's other edifices. Interestingly, Shchusev was at the same time designing the famous gravestone of Arkhip Kuindzhi, which, adorned with a mosaic piece designed by Nicholas Roerich, is now in the graveyard (the so-called "necropolis") of prominent figures of Russian culture at the Alexander Nevsky Lavra (Monastery) in St. Petersburg. The niche where Kuindzhi's bronze bust is seated is echoed in the Stolypin gravestone, but in the latter structure, the niche is transformed into a ciborium and the mosaic image is transferred from the background onto the stone itself. Kuindzhi's and Stolypin's (second version) gravestones have an uncanny architectural similarity, although their symbolical overtones, characteristic for sculpture and painting, are different. 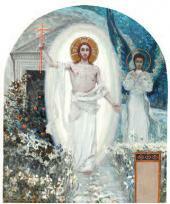 The choice of the theme for the composition, "The Resurrection of Christ", is noteworthy. 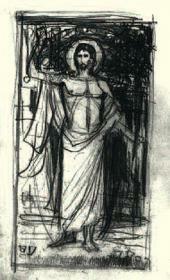 Here Christ stands with a halo, the shroud falling away from him, over the stone displaced from the tomb of Jesus. The fingers on his right hand are raised in a gesture of blessing, while the left hand holds a crucifix. 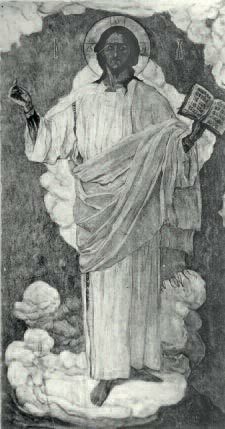 Some believe that Pavel Korin was the model for Nesterov's Christ. The story itself was treated in broadly the same way as in the artist's works for the St. Vladimir (Volodymyr) Cathedral in Kiev and the Church of the Saviour on the Spilled Blood in St. Petersburg, but was re-interpreted and re-worked at an absolutely different level. This is the same "Russian" Christ, the quest for whom Nesterov had begun at the Marfo-Mariinsky Convent and continued in Sumy. But why, precisely, was the Resurrection theme featured on the cross? 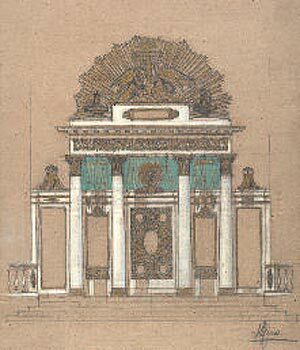 The clue to the symbols can be found in inserted inscriptions featured on Shchusev's drawing with Nesterov's sketch, which were left out of the simplified version. The side with the crucifix carries a phrase from the akathist to the Cross, "Before Thy Cross we bow down in worship, O Master, and Thy holy Resurrection we glorify", while the reverse, right under the mosaic inlay, features a phrase from the Gospel about deeds perishable and eternal: "Labour not for the meat which perisheth, but for that meat which endureth unto everlasting life, which the Son of man shall give unto you" (John 6:27). Together with the theme of the mosaic piece, these inscriptions convey the message that Stolypin's deeds will live after his death. Ten years later Shchusev used this symbolism in his most famous funereal monument, that for Vladimir Lenin's mausoleum, although the gulf between these political figures, each fateful for Russia in their own way, was considerable. In these two vastly different memorials Shchusev conveyed the idea about the importance of human deeds both in their historical contexts and vis-a-vis eternity. Like the Sumy iconostasis, Stolypin's gravestone was left unfinished. World War I and the revolution thwarted plans for the execution of Shchusev's second version and combining the mosaic with the gravestone, and the piece for a long time was kept, separately from the cross, at St. Petersburg's Academy of Fine Arts; today it is the property of the Russian Academy of Fine Arts. Such newly discovered materials about the creative collaboration between Nesterov and Shchusev widen our knowledge of their religious artwork. Their three joint projects have much in common: they worked on the Sumy iconostasis (1911-1914) and Stolypin's gravestone (1912-1913) practically at the same time, during an interval between two stages of the construction of the Marfo-Mariinsky Convent (1907-1912, 1914); in addition, Nesterov accomplished all his paintings in Moscow, which explains their stylistic similarities, making them, arguably, a single series of artwork. 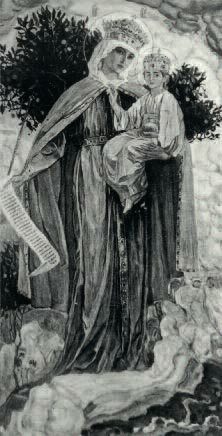 At this stage Nesterov set himself free of Vasnetsov's stylistic influence and worked out his original artistic vocabulary for religious images. His collaboration with Shchusev marked for Nesterov an essentially new, and final, stage in his work as a church artist. Shchusev, on the contrary, had a new goal to achieve in each new project - to fit into a particular historical architectural environment (the Zamoskvorechye neighbourhood in Moscow, a classical church in Sumy, and Kiev's Pechersk Lavra), and every time the solution he found was very elegant, maybe even causing Shchusev to sacrifice his personal stylistic preferences and ambitions (which was not the case with Nesterov). Sensitivity to this sort of cultural and historical texture of a place is manifested in Shchusev's many projects, including his already-mentioned masterpiece on Red Square in Moscow. An excellent draftsman himself, Shchusev always regarded architecture within a context of synthesis of the arts, which becomes obvious if we look at the names of the contemporary artists and sculptors who repeatedly worked with him (Nicholas Roerich, Alexander Benois, Yevgeny Lansere, Kuzma Petrov-Vodkin, Ignatius Stelletskii, Natalya Gon-charova, Sergei Konenkov, and others). After the revolution Shchusev and Nesterov never worked again in the field of church architecture, but they remained on friendly terms for the rest of their lives. Shchusev became one of the leading Soviet architects. Nesterov shifted the focus of his energies to the genre of the portrait, in which he won recognition in the new Russia: his last model, whom he painted shortly before death, was Alexei Shchusev. 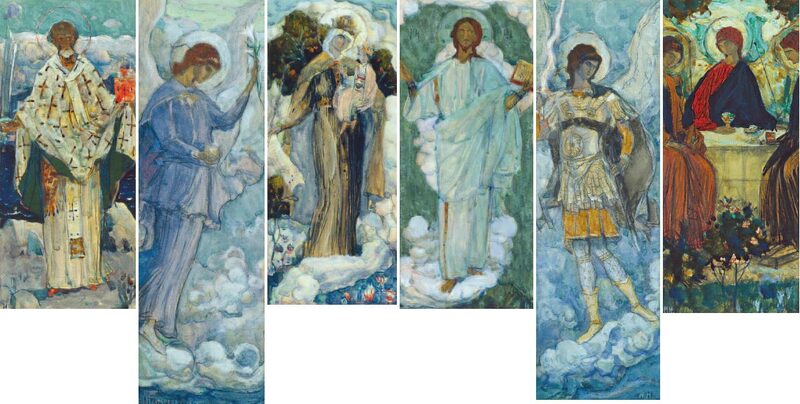 More on this: Koluzakov, S. 'Creative collaboration of Mikhail Nesterov and Alexei Shchusev. Disagreements and compromises' In: "Mikhail Nesterov. In Search of His Russia". Catalogue. Moscow, 2013. Pp. 231-244. A reference to the St. Vladimir (Volodymyr) Cathedral in Kiev (the artist worked on its murals in 1890-1895) and the church dedicated to Alexander Nevsky in Abastumani (1898-1904). Nesterov, Mikhail. "Letters. Selections". Leningrad, 1988. P. 293. Further, Letters. Nesterov, Mikhail. "My Bygone Days. 1862-1917. A Memoir". Moscow: 2006. P. 412. Further, My Bygone Days. My Bygone Days. P. 464. Russian National Archive of Literature and Arts. Fund 2980. File 2. № 1151-1, 4, 5, 6, 7, 8. Durylin, Sergei. "Nesterov in Life and Art". Moscow, 2004. P. 262. Rybas, Svyatoslav. "Stolypin". Moscow, 2012. P. 248. Department of Manuscripts of the Russian Museum. Fund 136. Item 24. Sheet 11. Nesterov's letter to Alexander Turygin. 28 April 1912. My Bygone Days. P. 433. Department of Manuscripts of the Russian Museum. Fund 136. Item 25. Sheet 5. Nesterov's letter to Alexander Turygin. 1913. Nesterov wrote the main part of his "Memoir", devoted to his collaborative work with Shchusev, in the second half of the 1920s. In this book he called the black marble cross actually mounted on Stolypin's grave "a makeshift tomb­stone", confident that there were plans to replace it with a new one (see Nesterov, "My Bygone Days". P. 467). However, in view of the latest findings, there seems to be little doubt that this cross was planned to be permanent from the start and that Nesterov's mosaic was intended precisely for it. So it would be correct to regard the wooden cross put on the grave during the first year after the death as the provisional gravestone. Department of Manuscripts of the Russian Museum. Fund 136. Item 25. Sheet 28. Nesterov's letter to Alexander Turygin. 11 August 1913. Ibid. Sheet 30. Nesterov's letter to Alexander Turygin. 18 August 1913. Frolov, Vladimir. 'As a memento for my sons' November 1921. In: "The Artist and the City". A collection of articles and documents. Moscow, 1988. P. 285. 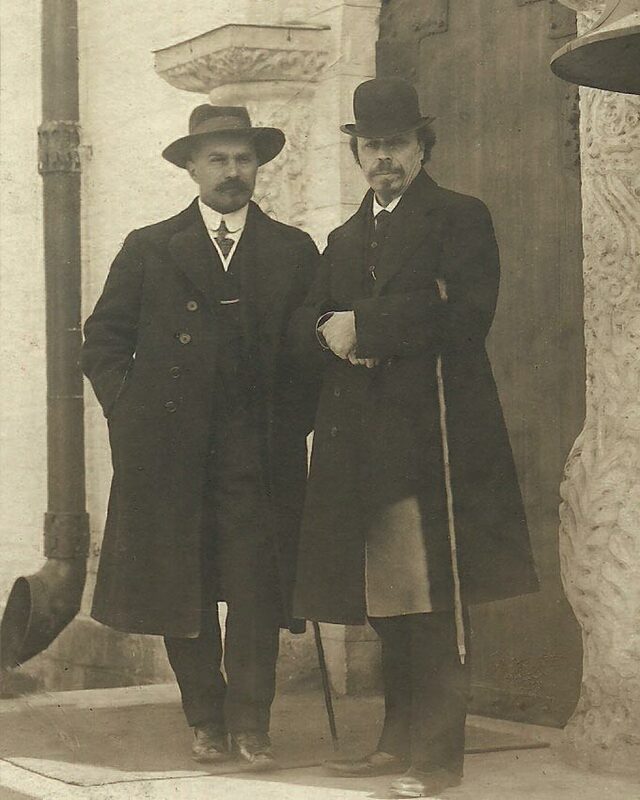 MIKHAIL NESTEROV AND ALEXEI SHCHUSEV IN THE MARFO-MARIINSKY CONVENT IN MOSCOW. Coloured pencils and coal on tracing paper. 104x70 cm. DEESIS. 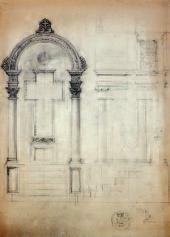 SKETCH OF THE CENTREPIECE OF THE ICONOSTASIS FOR THE CHURCH OF THE INTERCESSION AT THE MARFO-MARIINSKY CONVENT IN MOSCOW, WITH AN EXAMPLE OF REPOUSSE WORK (BOTTOM OF IMAGE). Russian National Archive of Literature and Art. Fund 2465. File 1. Item 835. Sheet 16а. Pencil on paper. 20.6x14.3 cm. Gouache, graphite pencil on paper. Fund 2980. File 2. Item 1151. Sheet 1. 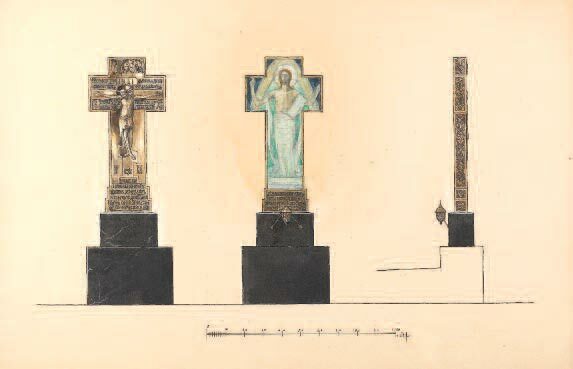 LEFT, BACK VIEW OF THE CROSS WITH THE SKETCH OF RELIEF WITH THE CRUCIFIXION; CENTRE, FRONT VIEW OF THE CROSS WITH THE STUDY FOR THE MOSAIC (MADE BY MIKHAIL NESTEROV); RIGHT, SIDE VIEW OF THE CROSS. PYOTR STOLYPIN’S TOMBSTONE IN THE KIEV PECHERSK LAVRA. Watercolour and graphite pencil on paper. 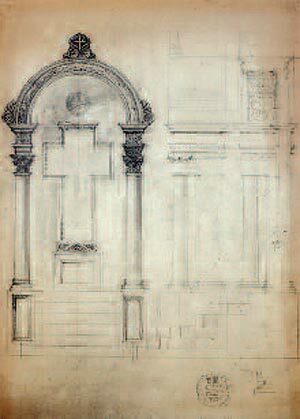 SKETCH FOR THE ALTAR WALL OF THE NORTHERN SIDE-ALTAR OF THE GALLERY OF THE CATHEDRAL OF ST. VLADIMIR, KIEV.